Salaried persons enjoy almost certain employment for a number of years without much risk. In addition, entrepreneurs, on the other hand, enjoy relatively more advantages compared to those usually by the person underemployment. In general, salaried persons at the end of a week or month get certain income, may not be that a big a sum. Paid persons may not require doing something very unique for their rise or promotion in the job, in many of the public jobs years of experience in enough. Yet these persons suffer from some limitations which many of them consider heavier relative to their advantages. The possibility of a mismatched career. Does not enjoy and pleasure of doing anything unique. Paid worker cannot easily provide jobs at their choice for someone they require to do. Let’s talk about advantages of becoming Entrepreneurs rather than salaried persons. The greatest advantage that the entrepreneur enjoy is the sense of ownership besides the pleasure of creating an enterprise and or running that same in the way he likes. 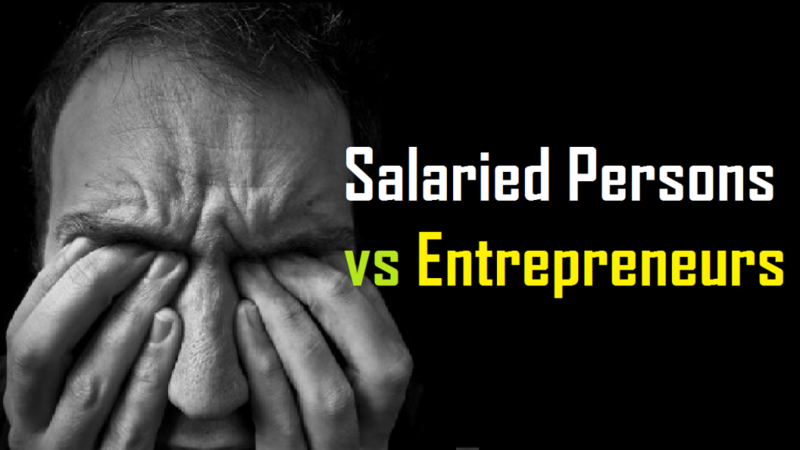 So, why you should become an entrepreneur, not salaried persons? Self-expression: At first the main advantages of becoming an entrepreneur is self-expression. You are the fee to talk and express your feelings and order. Community service: While you are an entrepreneur you have to serve the community. But paid persons have to way to serve the community on that way of entrepreneurs. Proving capability better than others. The desire to occupy time when financially independent, regards of age. Enjoy greater prestige and status in the society. Desire to supplement income after retirement. You can show your own creativity and efficient. As a result, now, this is your choice what you will do. Salaried persons or entrepreneurs.